When a fire blazes, a thief strikes or a cup of coffee spills, having a backup copy of your computer files is a major relief. Hardware can be replaced, but retrieving precious photos, your extensive music collection and the past few years’ tax returns – well, not so simple – until now. Avast! BackUp is an online backup and recovery service that allows you to select sets of data or individual files you want to back up. For example, if you only want to back up your music, you could choose files with .mp3 extensions, or, like me, if you want a backup of Outlook to preserve work contacts, you can choose Outlook email and contacts. For a second level of protection you can also back up to a local external drive. The first time you back up your data, it can take a while. For an average home system with a typical broadband connection, avast! BackUp works at the rate of about 2-4 GB per day – that is if you continue emailing and surfing the web during the backup. If left undisturbed on a fast connection, you can back up over 9 GB in a single day. My two month old laptop, with upload rates tested at 0.31 Mbps, took 05:08:52 to completely back up 347 files totaling 634.5 MB. If you have a huge set of data, it could take days. However, after that initial backup, avast! BackUp only backs up parts of the files that have changed. By doing this, your backup is quick and uses less bandwidth. Subsequent backups of my data have taken about 18 minutes. Befitting a security company of our caliber, avast! makes sure your data is secure in every step of the backup process. Avast! 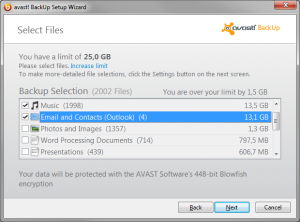 BackUp encrypts your data locally using 448-bit Blowfish encryption before it is sent to a Tier 4-level avast! data center over a secure 128-bit SSL connection. The data center is secured by gated perimeter access, 24/7 on-site security and technical personnel who walk around with snarling dogs, electronic card-key access, CCTV surveillance, fire detection and suppression systems, redundant power distribution units, and seismic safeguards that can withstand a 7.5-magnitude earthquake and rogue Justice League members. Your collection of Disco hits from 1977 are certainly safe and secure with this backup. When you need to restore files, it's quick and easy with the avast! BackUp software on your computer or you can log in to your account online. You can restore one file, a few files, or all of them including older versions or files that you deleted from your computer in the past 30 days. Put backing up your computer files at the top of your New Year's Resolutions list and try avast! 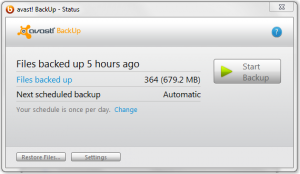 BackUp free for 30 days. Basic storage (25 GB) requires a $4.99/monthly subscription and maximum storage (75 GB) is $9.99/month.